Ify Chiejina addresses notions of home, cultural belonging, and the ways in which family history is passed down and remembered through objects. Taken by the linear qualities of the Mall’s unique store signs and enamored with the West African fabric stores upstairs, Chiejina created pieces that incorporate Nigerian fabric patterns and highlight the potential of line to layer meaning. Chiejina’s Dying to Dream series was created in the months following the 2014 shooting and trial of Michael Brown in Ferguson, Missouri. The works depicts portraits of black men and women surrounded by a cacophony of tidal water that is simultaneously threatening and life-affirming. 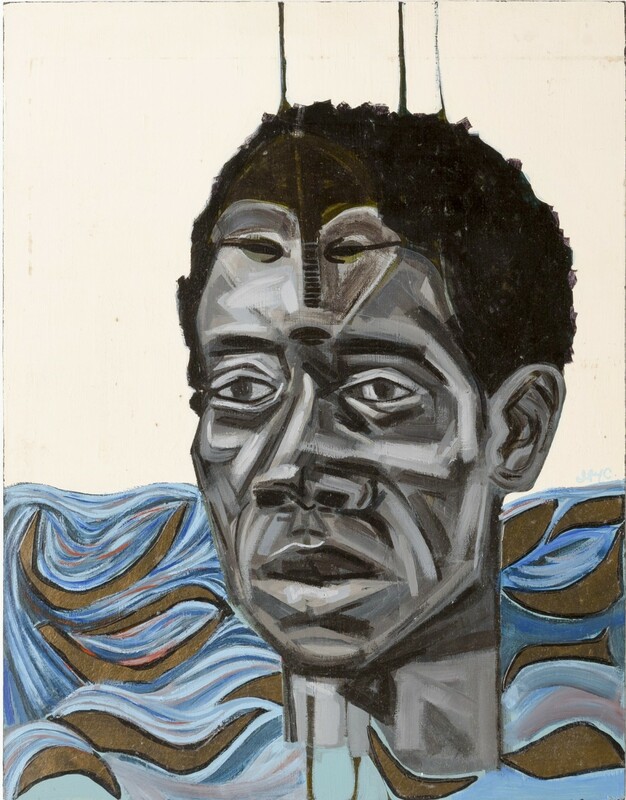 A mask embedded into the forehead of a figure isolated amongst waves in Thrown off the Boat, link to passages of colonial enslavement and racial discrimination through Africa and the United States. The water in these paintings can also be read as buoying and replenishing elements. 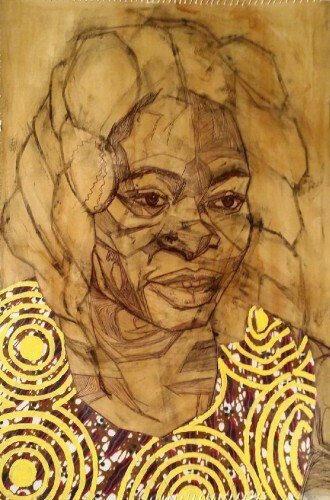 For Portrait of Mom, Chiejina references a photograph of her mother, a fashion designer, taken in Nigeria in 1975. The artist’s mother passed away in 2014 and in her works, Chiejina meditates on absence. By making her own layered marks, Chiejina recreates artifacts that infuse her own perspective and memory into the portrayal of her mother, articulating a vision of a re-remembered memory. Aba 1 visualizes the inferred stories that we weave together from scraps of information connected to found objects. The artist uncovered a photograph of her mother, the same image used to create Portrait of Mom, at her home in Queens. On the backside, she discovered commercial markings of the photography studio and a reference to the place the photograph originated. Aba, a city in southeast Nigeria, was the likely location that the photograph was taken before it came to the U.S. Aba 1 addresses the stories that remain untold, yet exist, captured and preserved, in the objects left behind.